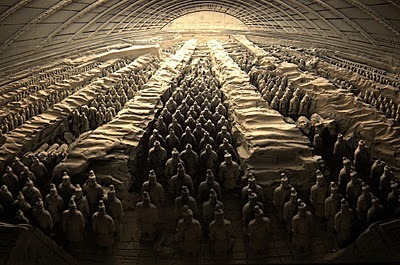 The tomb of Qin Shi Huangdi, the first emperor of China is loaded with historical significances. This mausoleum, which is seen as the epitome of Emperor Qin Shi Huangdi’s boundless power and prestige is located 30 km to the outside of X’ian in the Shensi province of China. Qin Shi Huangdi was the only ruler who single-handedly unified the seven warring clans of the China of 221 BCE and commanded massive construction of several public infrastructures as well as the legendary Great Wall of China.